So, you have decided to go for it, your first exhibition. The show organiser has given you two options. A shell scheme package or space only. Where do you start and what does this mean? Shell scheme packages can be great. They are usually pre-erected rows of identical stands and you turn up to the build and decorate yourselves. It typically includes stand walls, lighting, flooring and maybe a power socket. It does the job, but you want to stand out. What other options are there? OK, you want to stand out from the crowd. But you don’t know where to begin and time is of the essence. You can’t be making endless phone calls, sourcing equipment thinking about carpets, power supplies, graphics, furniture, technology. Then there are the logistical issues. How will you get everything you need to site? This is where Mercer Exhibitions can help. With our all inclusive, custom modular stand packages we can take all your worries away. We can design, manage, quality test, ship and install your stand. Your package would include our MEcore frame, our MEpeel graphics and our MEfresh technology. Lighting, sound, TV’s and much more. Our Designer will tailor a stand to your exact requirements, meaning a completely bespoke design which will set you apart from your competition. You will receive fully rendered visuals with your graphics included and have a choice of carpet colour or wood effect vinyl. You will have a designated Project Manager that will handle everything for you with the show organisers. From calculating power needs to submitting Risk Assessments and Method Statements. So, it all sounds good, but what are the costs involved? Our MEvolution Package offers fixed price exhibiting, for just £280 per square metre, plus a £2000 install fee. It’s great value! “CMAC have used Mercer Exhibitions for 4 stands this year, all of which have been delivered brilliantly! We are delighted to be working with not only a local company but also with a company that takes the time to understand our business and more importantly what we want to achieve at each show. Fair to say, they have secured our business for next year! 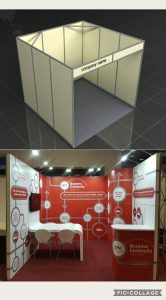 The image below shows a typical 3 x 3m shell scheme stand, compared to the most recent CMAC stand that we built using the same sized space.